I adapted this recipe from a cookbook called "Pure and Simple: Delicious Whole Natural Foods Cookbook: Vegan, MSG Free and Gluten Free" by Tami A. Benton. This was the first recipe I tried since getting this cookbook about a week ago. Although I was a bit nervous at just how pure and simple this recipe really seemed, it did not disappoint (more on that to follow)! Saute ginger & garlic in peanut oil for about a minute. Add cabbage and red pepper and saute for 2 more minutes. Add onions, lemon juice, water, salt and pepper. 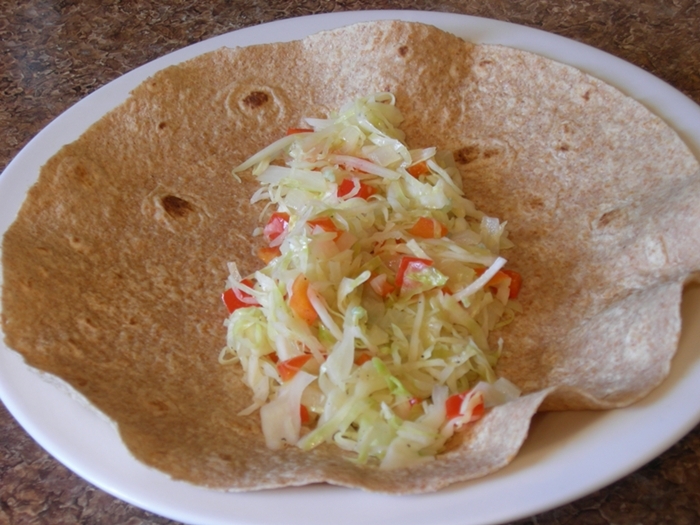 Serve ingredients over tortillas and top with salsa. I was very pleased with how this recipe turned out! It was really tasty. 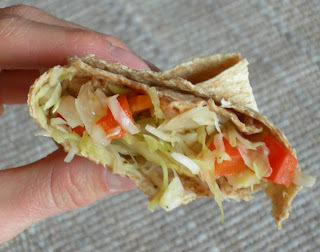 It tasted just like an egg-roll with Mexican flare! It may sound like an odd combination, but the flavors go really well together! Who knew? I paired this recipe with chips and salsa. 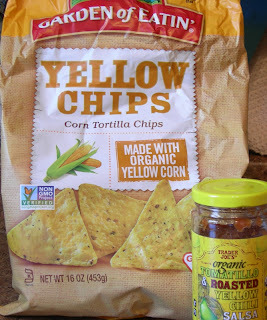 I use Garden of Eatin' Organic Yellow Tortilla Chips and Trader Joe's Organic Tomatillo & Roasted Yellow Chili Salsa. Click on the names for ingredient information. Ideally, I like to make my own salsa and avoid anything with citric acid, which has the potential to contain free glutamic acid when derived from non-organic corn, but I'm assuming in the salsa the citric acid is naturally derived from the tomatoes. Any thoughts? When I don't have any made or am pressed for time, overall I'm satisfied with the ingredients in Trader Joe's salsa. As for the chips, I really, really like Garden of Eatin'. I can't recommend enough that you support them with your wallet. Not only do their products contain natural ingredients, but they're also one of the few companies I've come across that actually list on their products that the product is "Non-GMO", or "not genetically modified". Since the FDA has yet to agree to force companies who use genetically modified ingredients to reveal such on their labels, Garden of Eatin' is being proactive by letting us know that they do not. They don't have to do that, they just want to! 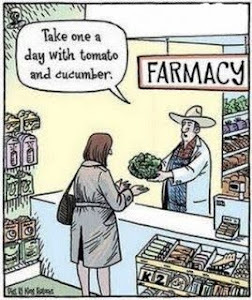 They make it easier for us consumers to make more informed decisions about what exactly we're putting into our bodies. 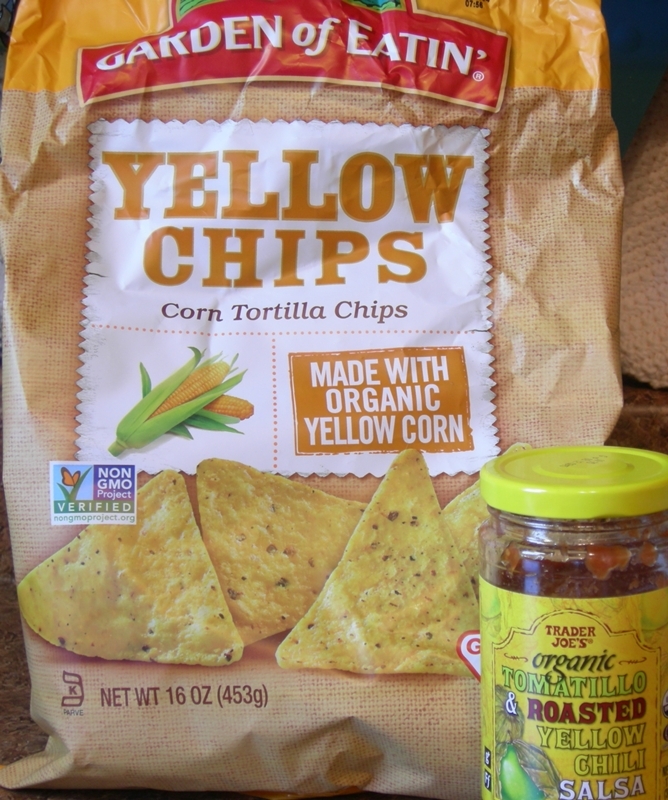 Their corn chips are made out of organic corn and therefore, free from genetic modification. They only contain three ingredients and they're very crisp, flavorful and not too salty. While I'm not familiar with all of their products, I have been pleased with the ones I have tried thus far. If you'd like to join me in telling the FDA to "label our food!" please click here to sign the petition that calls upon the FDA to label genetically modified food.